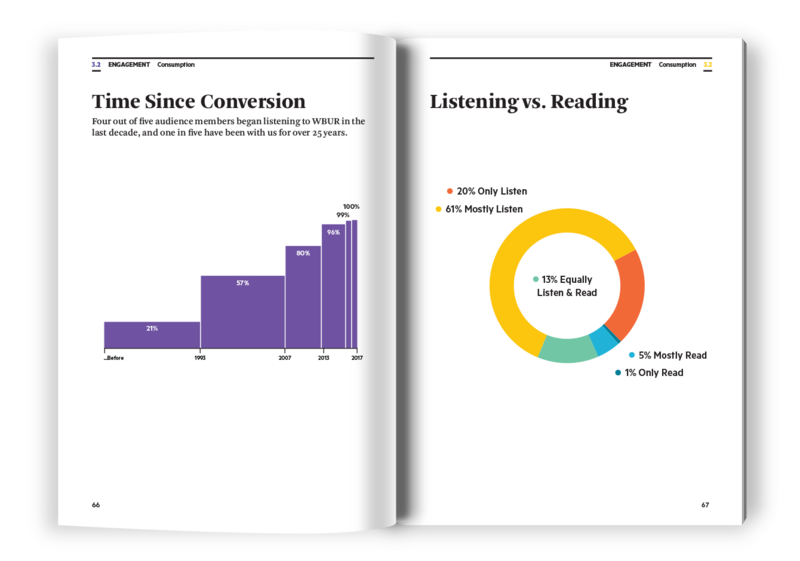 As one of the largest national public radio stations, WBUR was finding it difficult to define the nature and needs of its changing audience. 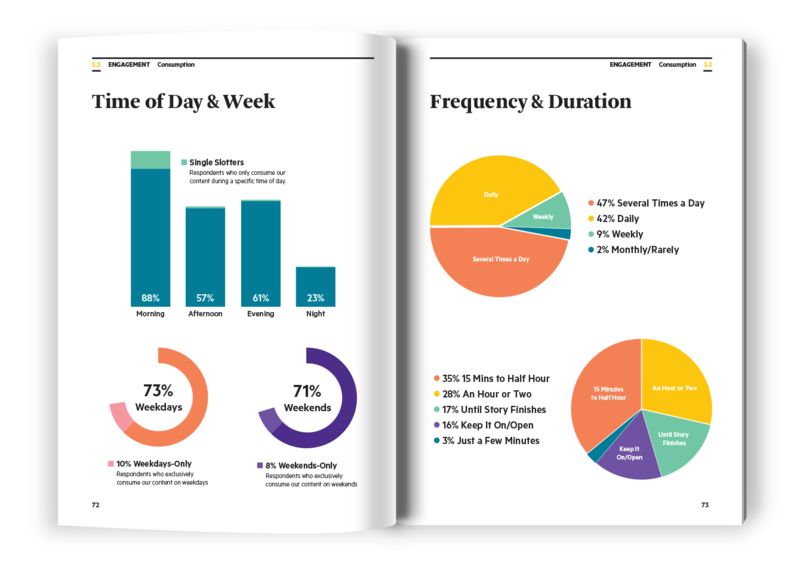 We led an in-depth research study to address this knowledge gap and taught both journalists and station managers how to derive actionable insights from their newfound understanding. 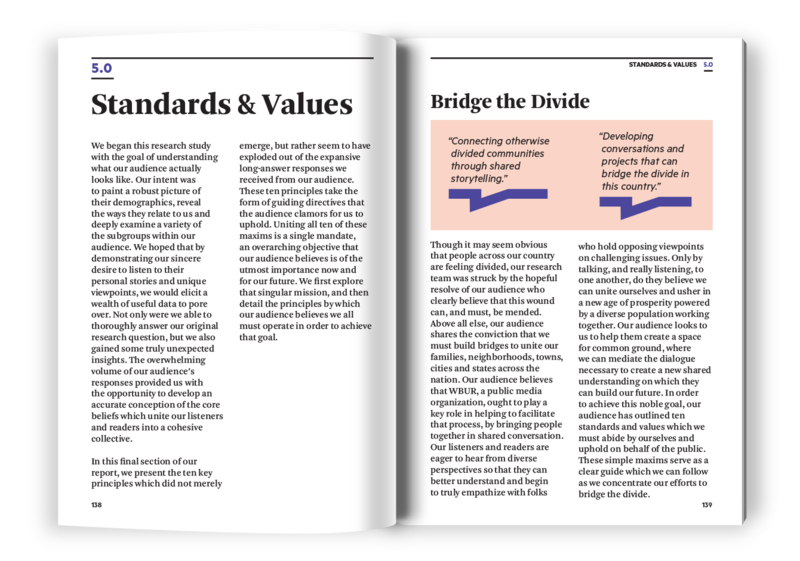 Realizing that the basics of ethnography aren't that different from the fundamentals of a newsroom, we adopted an experimental approach in which we guided the station's journalists through the process of designing and conducting a massive user study. 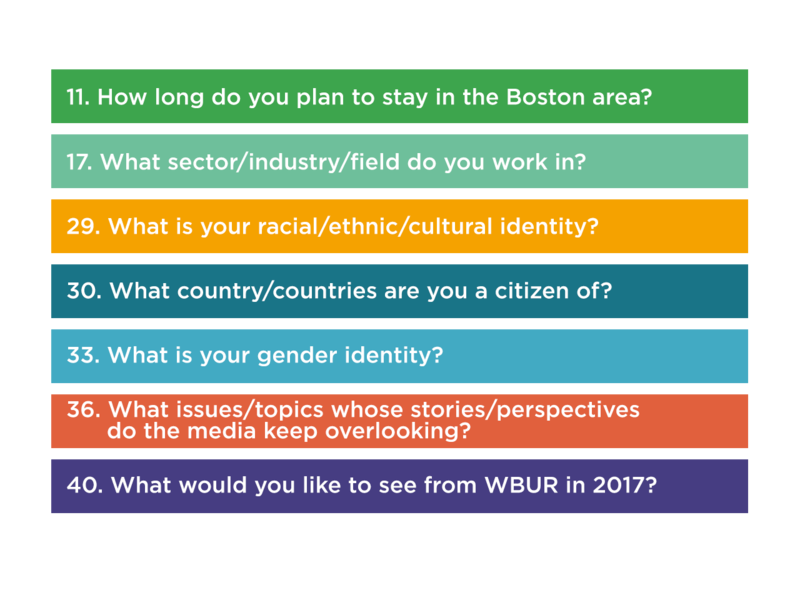 Working together under our advisement, 36 individuals from WBUR decided to ask and answer the simple yet crucial question: "what does our audience actually look like?" 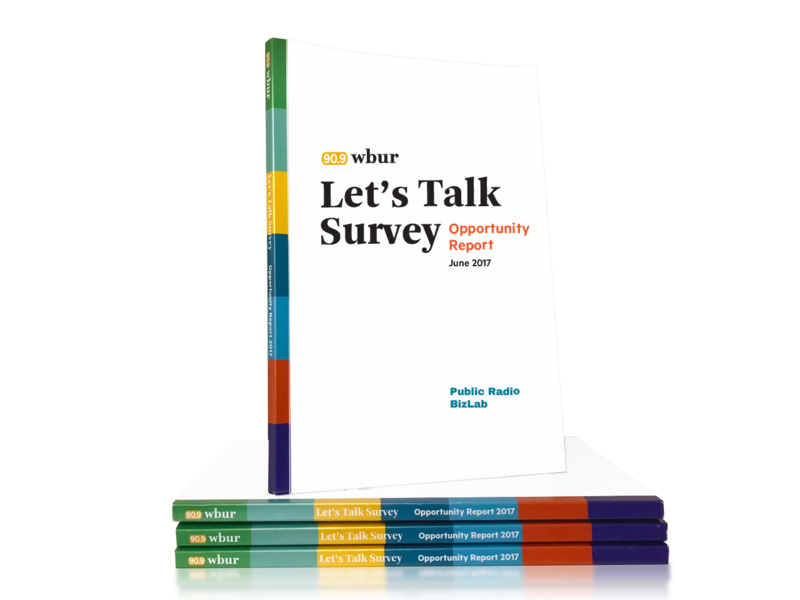 The dry summaries from the Nielsen Scarborough reports weren't enough to develop a rich picture of WBUR's audience, so we worked with the newsroom team to identify 40 data points that painted more nuanced portraits of their listeners. 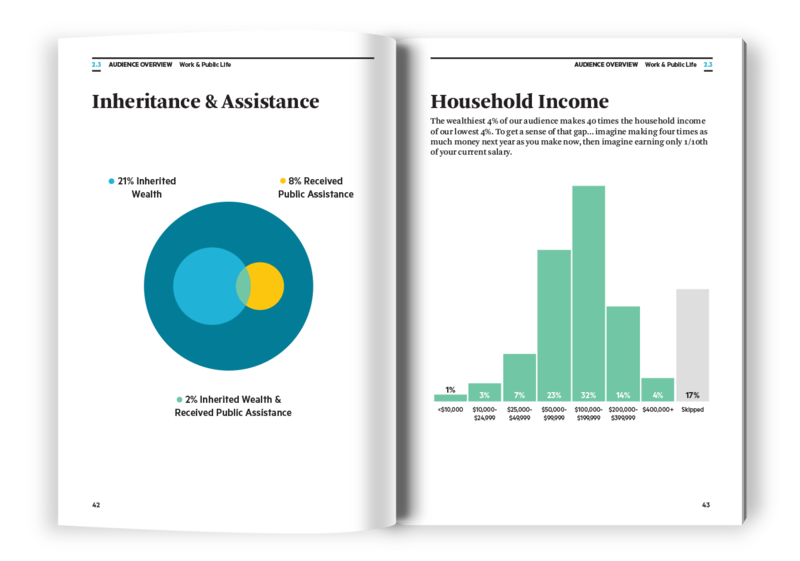 We created an open-ended online survey, carefully choosing the narrative arc of the questions to draw out information about our audience's identities and opinions—without imposing our worldview on them. 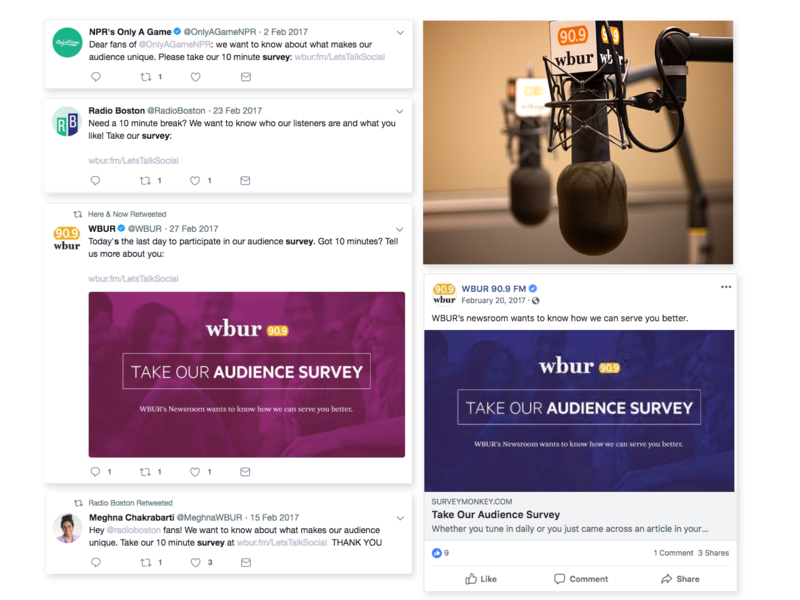 Because the station was not yet in the habit of listening to their audience, we stressed the importance of making sure the team heard from the folks at the fringes of the WBUR community who may have not felt welcome to speak up before. To make that intention clear, we named the survey “Let’s Talk,” and crafted a strategic messaging and distribution plan that was as inclusive and expansive as possible. 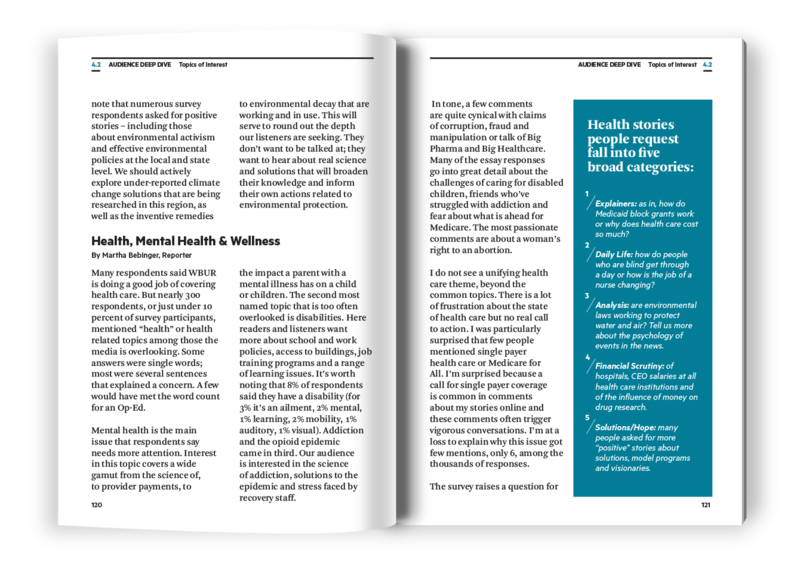 During the one month survey period over 3,600 people responded with thousands of short answers and 500+ pages of essay text. 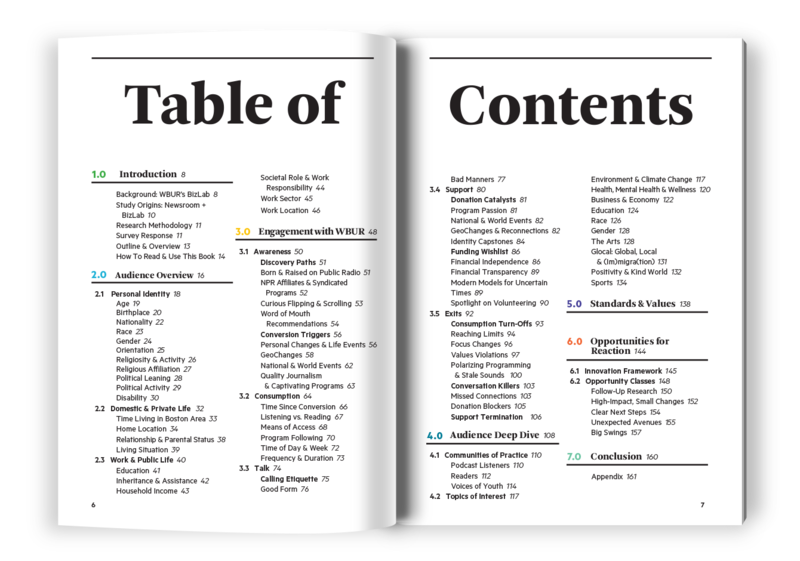 The study reached more than ten times the number of people used for standard demographic reports at the station, and produced a mountain of nuanced information. 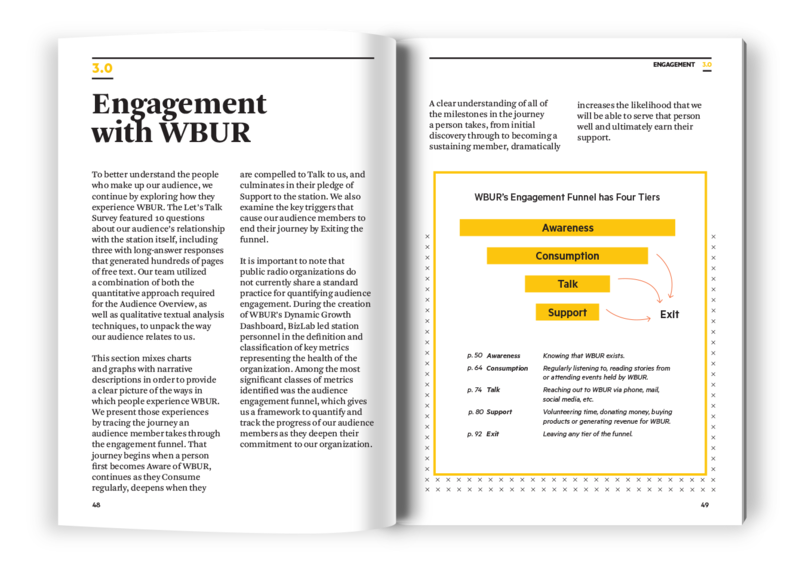 Guiding the team, we analyzed all the data to form a grounded theory of WBUR's audience. 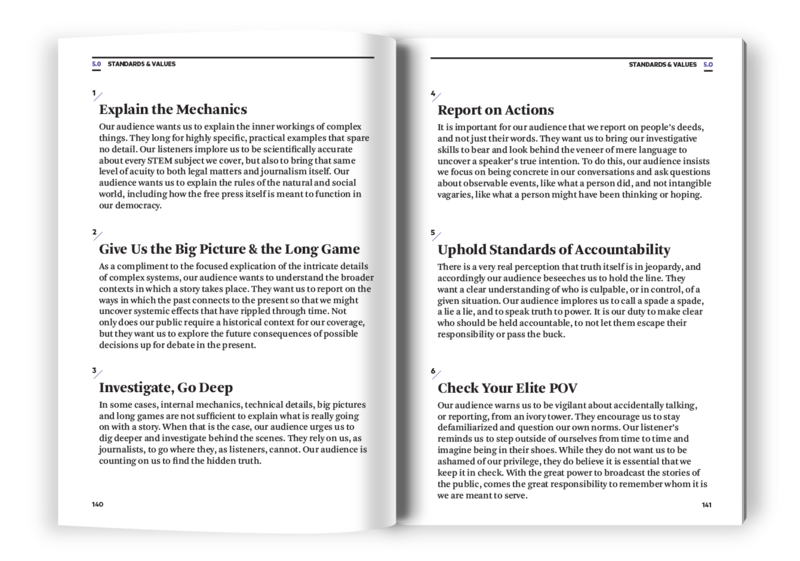 And for the journalists who wanted to dive into specific areas more deeply, we coached them through the process of writing their own detailed reports. 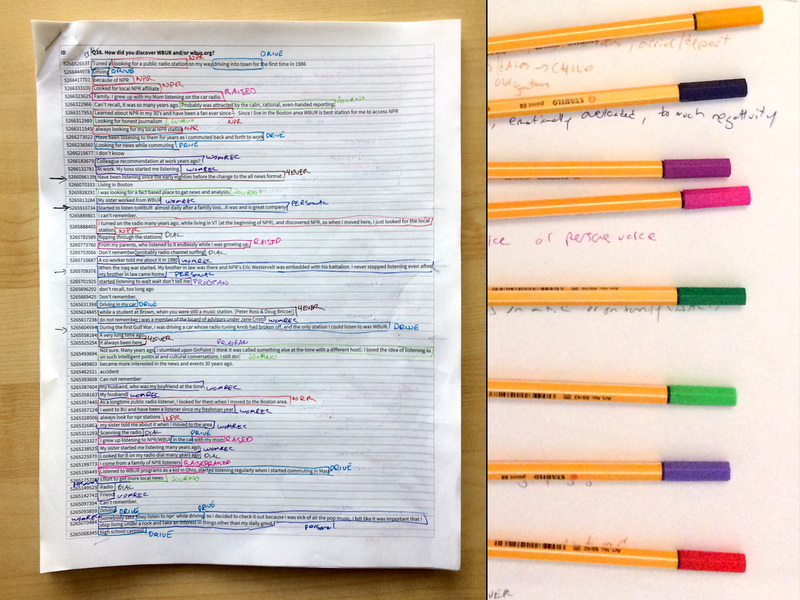 The output of our collaborative analysis was just as overwhelming in volume as the response from the audience. 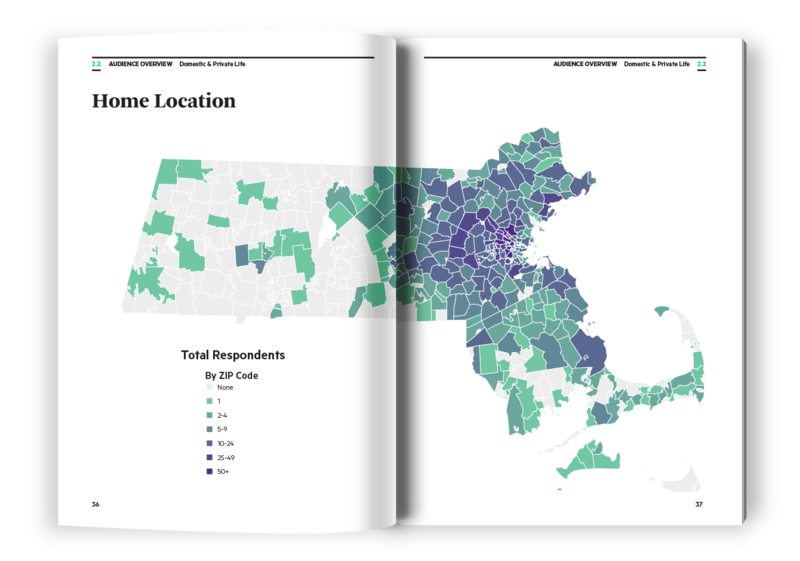 Though many WBUR staffers had joined the research team, there were others who had only a passing knowledge of the project. 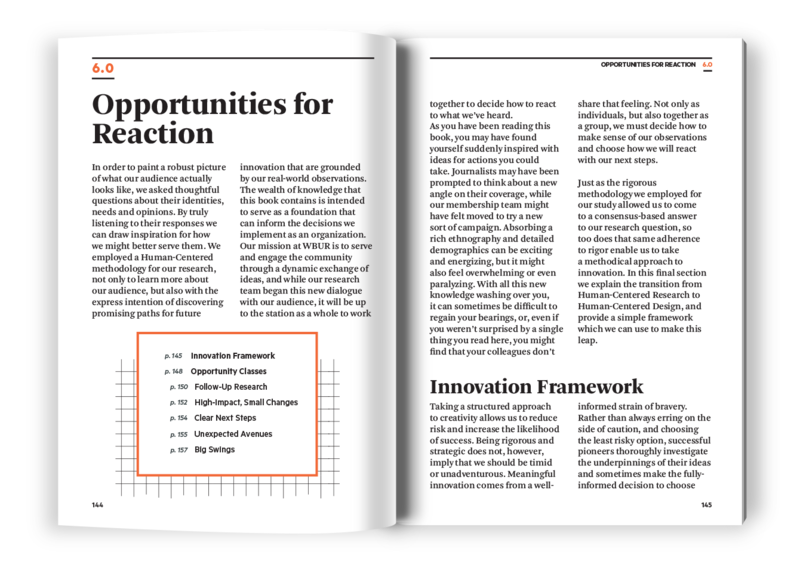 To ensure that this deep understanding of the audience would be shared by all employees and affiliates of the organization, we published a 160-page "Opportunity Report" book that encapsulated the extensive findings from the study and offered a roadmap for future human-centered innovation. 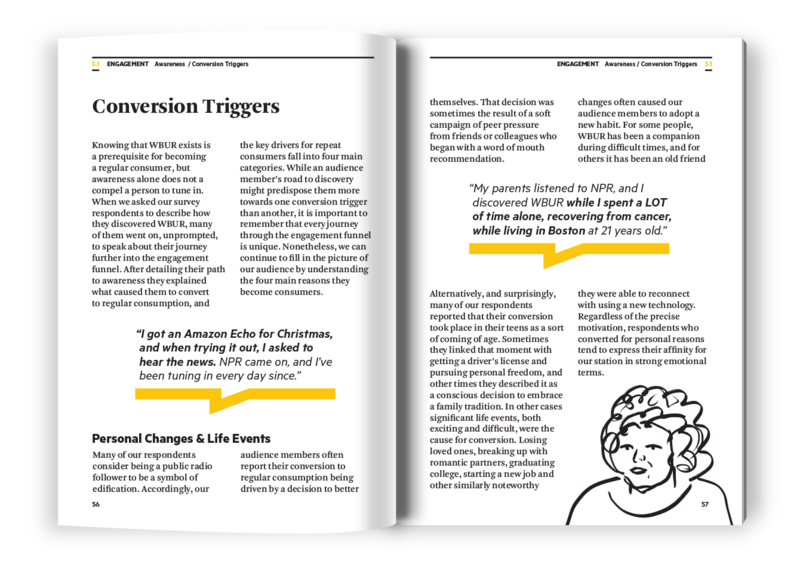 As a publicly-funded entity, WBUR needs to think of creative ways to serve its listeners while supporting itself. 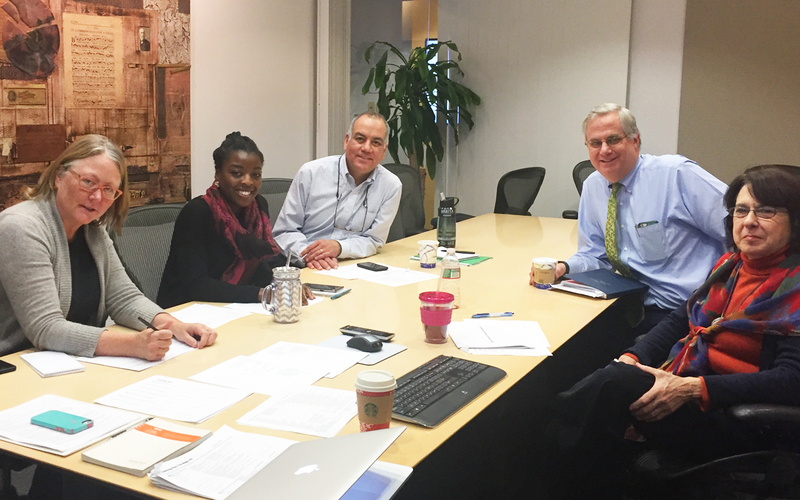 Building upon the research conducted by the station's journalists, we organized a workshop for WBUR's management and outside collaborators to brainstorm new avenues for innovation. 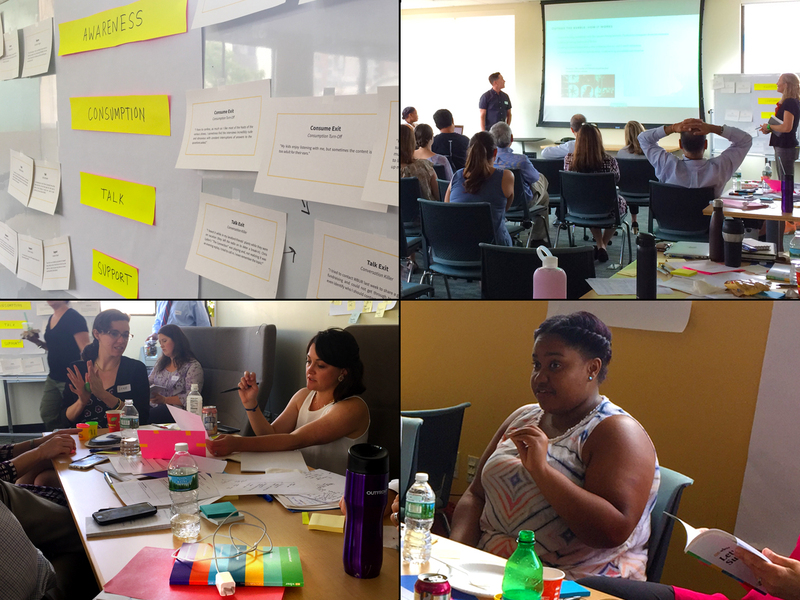 By leading the group through empathy-building exercises and design prototyping sprints, we generated a portfolio of 20 unexplored opportunities for the station to begin testing.